F.C. Harper, London; Christie's, London, 30 June 1924, lot 144, one of two, as 'Sadlier: Christ Walking on the Water - on copper; and The Madonna and Child - on panel' (unsold). Arthur Stuart, 7th Earl Castle Stewart (1889-1944), who in 1920 married Eleanor May Guggenheim (d. 1992), daughter of Solomon R. Guggenheim, and by descent. We are grateful to Dr. Erich Schleier and Professor Alessandro Brogi for the attribution, given independently after inspection of the original and on the basis of photographs respectively; Professor Brogi dates the picture to 1590-1600. We are also grateful to Dr. Simone Twiehaus for confirming the attribution on the basis of photographs and for her assistance with cataloguing this lot. 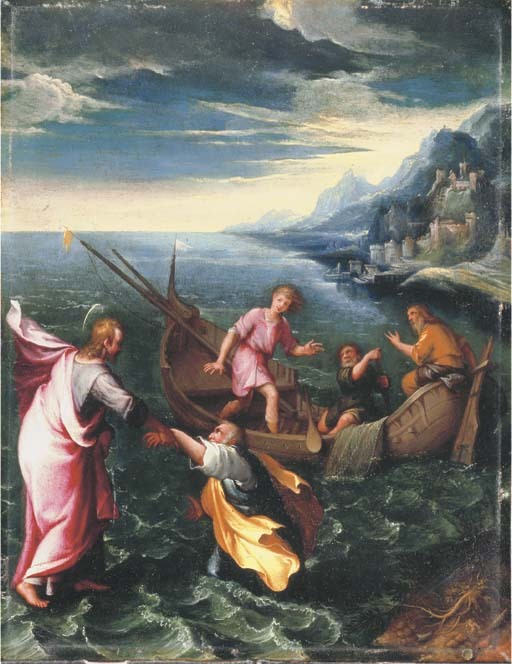 The general composition is known, with variations, in two other works by Calvaert: that in the Staatliche Kunsthalle, Karlsruhe, formerly attributed to Federico Zuccari (inv. no. 1775; J. Lauts, Staatliche Kunsthalle Karlsruhe, Katalog Alte Meister bis 1800, I, p. 238, II, fig. 71), and that sold, Sotheby's, London, 21 April 1993, lot 313, as Attributed to Denys Calvaert. In addition, there is a drawing in the Louvre, Paris (inv. no. 10108; E. Starcky, Inventaire general des dessins des écoles du nord, Paris, 1988, p. 71, no. 73). The inscription on the reverse presumably follows the traditional attribution of the Karlsruhe picture, although there is no known engraving of the composition by Sadeler; there are, however, slight compositional similarities with his engraving of the treatment of the subject by Barocci, whose work strongly influenced Calvaert.